Priced below KBB Fair Purchase Price! 2LT Package*, Alloy Wheels *, Backup Camera *, Bluetooth*, Off Road Package*, Power Mirror Package*, Tow Package*, Remote Start*, Power Package*, Factory Trailer Brake, Monochrome Package, 6-Speed Automatic Electronic with Overdrive, 4WD, jet black Cloth, 3.42 Rear Axle Ratio w/5.3L V8 engine, ABS brakes, Alloy wheels, Bed Liner, Compass, Deep-Tinted Glass, Electronic Stability Control, Emergency communication system, EZ Lift & Lower Tailgate, Heated door mirrors, High-Intensity Discharge Headlights, Illuminated entry, Low tire pressure warning, Premium audio system: Chevrolet MyLink, Radio: AM/FM 8" Diagonal Color Touch Screen, Remote Keyless Entry, Remote keyless entry, Single Slot CD/MP3 Player, SiriusXM Satellite Radio, Traction control. 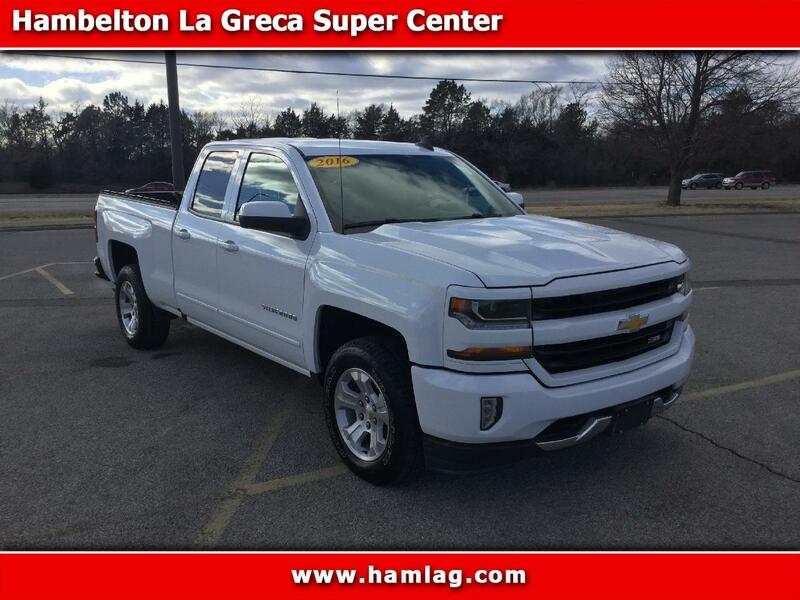 Hambelton LaGreca Super Center WWW.hamlag.com. Summit White 2016 Chevrolet Silverado 1500 LT 4D Double Cab V8 4WD 6-Speed Automatic Electronic with Overdrive Excellent Financing Available!